LAS VEGAS (Oct. 3, 2016) – The LINQ Promenade – Caesars Entertainment’s open-air shopping, dining and entertainment district – welcomes the arrival of Gordon Ramsay Fish & Chips with a special ribbon cutting celebration on Friday, Oct. 7 at 11 a.m. The takeaway-style British restaurant officially opens at 11 a.m. with Gordon Ramsay on hand for a ribbon-cutting ceremony. Fans are encouraged to join the festivities and welcome Ramsay in true British fashion. Located near the Strip entrance to The LINQ Promenade, guests will be able to view the chefs in action as they prepare the made-to-order dishes. Specialty items include hand-cut, sustainable True Alaskan Cod filets, battered and cooked to order, battered sausage, gulf shrimp and a fish sandwich. The hand-cut chips will be served slightly salted or seasoned with truffle and parmesan; chipotle, jalapeno and chorizo; or cacciatore spice and fresh basil. Gordon Ramsay Fish & Chips will open daily at 11 a.m. with indoor and outdoor seating for more than 40 guests. This is the fourth Las Vegas restaurant of the award-winning chef, joining Gordon Ramsay BurGR at Planet Hollywood Resort & Casino, Gordon Ramsay Pub & Grill at Caesars Palace and Gordon Ramsay Steak at Paris Las Vegas. Zombies take over The LINQ Promenade beginning Saturday, Oct. 8 with the launch of The Zombie Escape. This exhilarating, all-new attraction will loom behind the High Roller, located on Koval Lane. Designed by a Hollywood studio, this nightmarish realm compels visitors to battle an infestation of the undead, replete with blood-curdling sights, spine-tingling screams and zombies ready to attack around every corner. Guests who make it through will save the world; those who fail are doomed to join the horde of the undead. The Zombie Escape will be open Saturday, Oct. 8 and Sunday, Oct. 9, then every Wednesday through Sunday night in October, including Halloween night, Monday, Oct. 31. Doors open at 7 p.m. Prices per person start at $20 for general admission; guests can purchase an RIP Pass (fast pass) for $28 (an $8 upgrade) or the High Roller plus Zombie Escape ticket combo for $45. Locals, military and Total Rewards members receive $5 off the general admission price. The LINQ Promenade will host a Halloween celebration on Thursday, Oct. 27 and Friday, Oct. 28. Starting at 6 p.m., the festivities will include Halloween-themed décor throughout the property, live music with family-friendly DJ Miguel, face painters, zombie stilt-walkers and a zombie LED drumline that will perform nightly. The popular “TRIQ or Treat” experience also returns this year, providing a safe environment for kids as The LINQ Promenade tenants hand out candy to all the little monsters. In addition, on Saturday, Oct. 29, The LINQ Promenade will host a costume contest with $10,000 in cash prizes for participants 21 and over. Casting a spirited glow over the entire spectacle, the High Roller Observation Wheel will be lit in Halloween colors! Trick or Treat: What’s to Eat? During October, Flour & Barley – Brick Oven Pizza will offer a seasonal specialty. The Autumn Pizza will be topped with red sauce, roasted butternut squash, smoked bacon, mushroom and arugula, for $17. Haute Doggery puts the "weenie" in Halloween with a spooky October special. Available exclusively Oct. 28-31, Haute Doggery will serve up a "Halloweenie Dog," featuring a char-grilled frank loaded with sauerkraut, mustard and "bloody onions" made with sautéed onions in the classic NYC-style red sauce, priced at $7. Celebrate Halloween with $3 street tacos and $4 Mexican street corn from Chayo Mexican Kitchen + Tequila Bar, available during Oct. 8-9, Oct. 12-30 (Wednesdays and Sundays only) and Oct. 31. These delicious treats will also be available at a popup stand, located near The Zombie Escape. The Ghirardelli Ice Cream & Chocolate Shop is happy to announce the return of the Pumpkin Spice Shake. Available for a limited time, this smooth and creamy milkshake features the sweetest flavor of fall blended with vanilla ice cream and drizzled with world famous Ghirardelli hot fudge. Topped with whipped cream, caramel sauce and a Ghirardelli Pumpkin Spice Caramel SQUARES chocolate, the Ghirardelli Pumpkin Spice Shake is the ultimate fall pumpkin indulgence. Beginning Oct. 8, Urban Turban will offer Turbanator Rolls – like a hotdog with chicken tikka filling, for $11.99. Chips and beer are also new menu items, now available. Click Here for File Photos of Halloween at The LINQ. The LINQ Promenade and High Roller join national efforts to bolster breast cancer awareness during Pink Week. On Thursday, Oct. 6, The LINQ Promenade Fountain Stage will host a silent disco (with all participants listening to music via wireless headphones) from 7 p.m. to 10 p.m. All events are FREE and open to the public. Attendees are encouraged to wear pink and donations will be accepted, with 100 percent of the proceeds benefiting the American Cancer Society. Guests purchasing High Roller tickets may donate to Breast Cancer Awareness all month long in October. Guests will receive a FREE pink bracelet with each $1 donation and a FREE pink alcoholic drink with each $5 donation. Beginning October 1, Flour & Barley – Brick Oven Pizza will be partnering with Joseph James Brewery to feature a hand-selected lineup of six beers set to take over the restaurant’s draft lines. Selections will include Joseph James Brewery’s American Flyer Craft Lager, Citra Rye Pale Ale, Berliner Weize Guy, Rojo Joe, Barrel Aged Imperial Mild and Single Minded, a collaboration with the Nevada Craft Brewers Association (NCBA) which also includes a donation. Founder and pastry chef of Sprinkles, Candace Nelson, debuts a cookbook featuring 50 Sprinkles Cupcake recipes and 50 of her favorite dessert recipes. “The Sprinkles Baking Book: 100 Secret Recipes from Candace’s Kitchen” hits shelves on Oct. 25 for $26 and is currently available for pre-order at sprinkles.com. Sweet-toothed readers who pre-order the book from Sprinkles will receive two free cupcakes to tide them over while they wait for publication date. For details on upcoming concerts, please visit brooklynbowl.com/las-vegas. What makes Brooklyn Bowl Las Vegas a stand-out venue for local businesses, as well as those visiting Las Vegas, is the variety of amenities that allow companies to make the space entirely their own for holiday parties and private events. For more information on Brooklyn Bowl’s event spaces, please visit brooklynbowl.com/las-vegas/private-events. More than a pub and sports bar, Tilted Kilt Pub & Eatery offers a festive, modernized Celtic-themed environment to watch the game, hang out with friends and nosh on its bar and grill food peppered with an Irish twist. On Oct. 8, Tilted Kilt Pub & Eatery will host a viewing party for UFC 204: Bisping vs. Henderson starting at 7 p.m. In October, stop by O’Sheas Casino and try the Irish Handcuffs (Guinness & Jameson Combo) for $13 or Pigskin Bucket Specials (five, 16 oz. wide-mouth cans of Miller Lite or Coors Light) for $29. Compete in Beer Pong Happy Hour 10 a.m. to 2 p.m. Mondays through Fridays for $15. Serving more than 50 American draft beers from across the country, this is the place to be for football. Fans will find featured beer and Ketel One specials during the Thursday, Saturday, Sunday and Monday football games. Also, guests who sign up for the Cityzen App will get five free drinks every day. Hours of operation during football season: Monday-Thursday: noon to midnight, Friday: noon to 2 a.m., Saturday: 8:30 a.m. to 2 a.m. and Sunday: 9 a.m. to midnight. The LINQ Promenade, an open-air shopping, dining and entertainment district, anchored by the world’s tallest observation wheel, the High Roller, has redefined the iconic Las Vegas skyline. Located at the heart of the world-famous Las Vegas Strip, The LINQ Promenade features more than 30 unique retail, dining and entertainment venues – including the first In-N-Out Burger on the Strip (opening winter 2016), Gordon Ramsay Fish & Chips (opening early October) and Brooklyn Bowl – and plays host to a variety of special events, festivals and more. 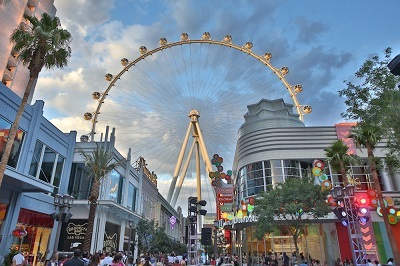 Topping out at 550 feet, the High Roller observation wheel, voted “Best Attraction of 2015,” “Best Amusement Ride of 2015” and “Best Place to View the City of 2015” by the readers and editors of the Las Vegas Review-Journal, is the focal point of the unique urban entertainment district. The wheel’s 28 glass-enclosed cabins feature an interactive experience including video and music that fade away to unveil spectacular views of the famed resort city in the 30 minutes it takes to complete one full revolution. Unique in-cabin experiences include the Happy Half Hour (for guests ages 21 and over and includes an open bar); North America's first in-cabin Chocolate Tasting Experience and Yoga in the Sky (a 60-minute experience that can accommodate up to six guests per 1-hour session). Cabins are also available for individual or group experiences. For more information, please visit TheLINQ.com or the Caesars Entertainment Las Vegas media room. Find The LINQ on Facebook and follow on Twitter and Instagram.